Anglachel... was so named because it was made of iron that fell from heaven as a blazing star; 1 it would cleave all earth-delved iron. One other sword only in Middle-earth was like to it. That sword does not enter into this tale, though it was made of the same ore by the same smith; and that smith was Eöl the Dark Elf, who took Aredhel Turgon's sister to wife. He gave Anglachel to Thingol as fee, which he begrudged, for leave to dwell in Nan Elmoth; but its mate Anguirel he kept, until it was stolen from him by Maeglin, his son. anga 'iron', Sindarin ang, in Angainor, Angband, Anghabar, Anglachel, Angrist, Angrod, Anguirel, Gurthang; angren 'of iron' in Angrenost, plural engrin in Ered Engrin. 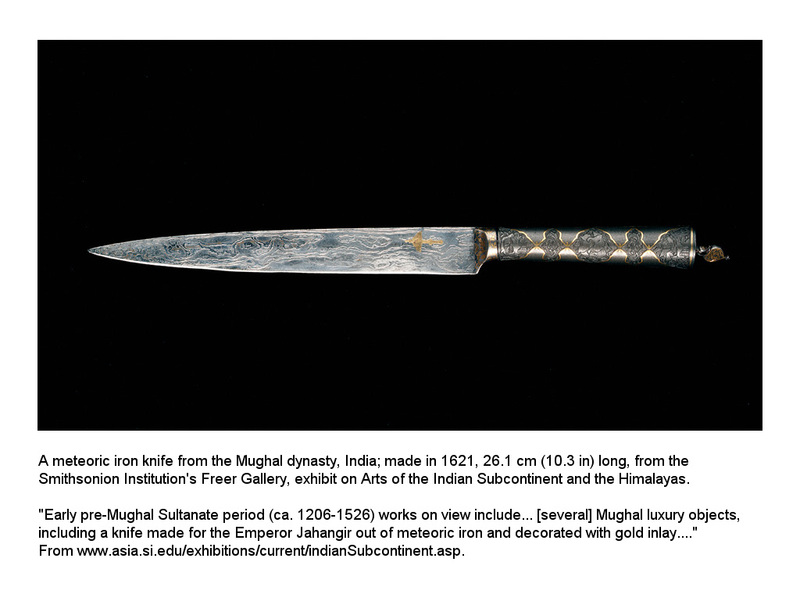 A meteoric iron knife of Mughal India, 1621, from the Smithsonion's Freer Gallery. "At dawn a tremendous noise arose in the east. It was so terrifying that it nearly frightened the inhabitants out of their skins. Then, in the midst of tumultuous noise, something bright fell to the earth from above...."
Thus did Emperor Jahangir describe a meteor that landed within his kingdom in April 1621. His fascination with unusual natural events — and his power to harness their aura — is revealed by this dagger's blade, forged from the glittering meteorite. Jahangir further noted that the blade "cut beautifully, as well as the very best swords."